My name is Guo Xing, and I’m the lead producer at ScreamBox Studio in Beijing. Our homage to classic vertical shooters, AngerForce: Reloaded, will release on PS4 in less than two weeks. To celebrate this exciting moment for us, I’d like to take you behind the scenes and talk about the conception of the game and some of the animation processes we use. Development began in 2013, and the tools we used were all developed in-house. It’s fair to say we lacked experience at that point. I recall the first time I saw the awesome 2D game Dragon’s Crown, and coming away totally shocked. I couldn’t believe the quality of their 2D animation. Following much consultation and research, we decided to continue development of our game using the Unity engine. In order to maintain efficiency, we reused most of the existing assets and kept the 2D aesthetic of the game. Animations were created using a third-party tool called Spine. Spine has become very popular in recent years, as it offers many convenient features: curve adjustment animation rhythm, grid deformation animation, allowing mixed animation playback, etc. Support for various engines is also a plus. With the help of these new tools, we were able to complete our complicated boss designs much faster. This boss design is made up of four stages, with each animation in each stage adding up to more than 40 animations in total. 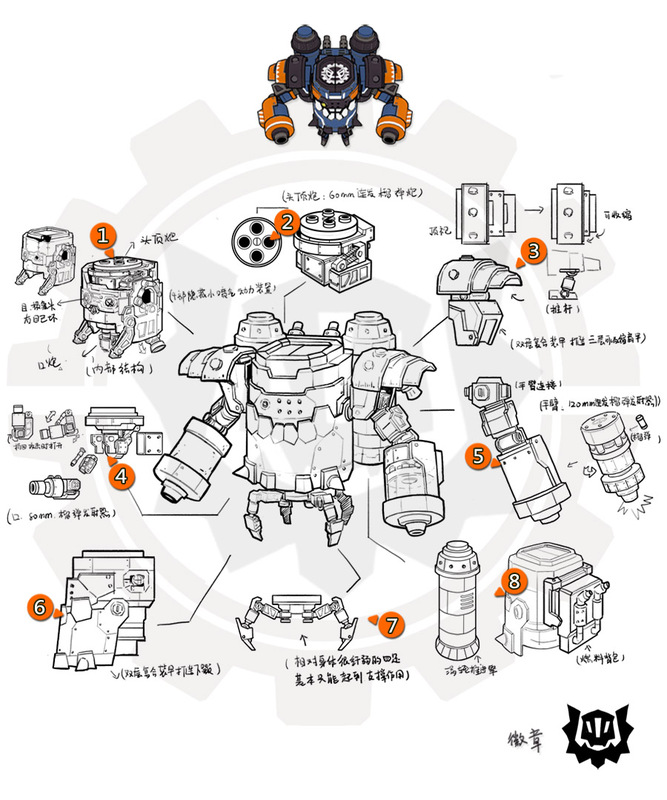 The boss is huge, but the texture used for all animations is only the 1024×1024 texture below. The kind of actions a body can make is determined at the design stage, and the resulting animations depend on this design. 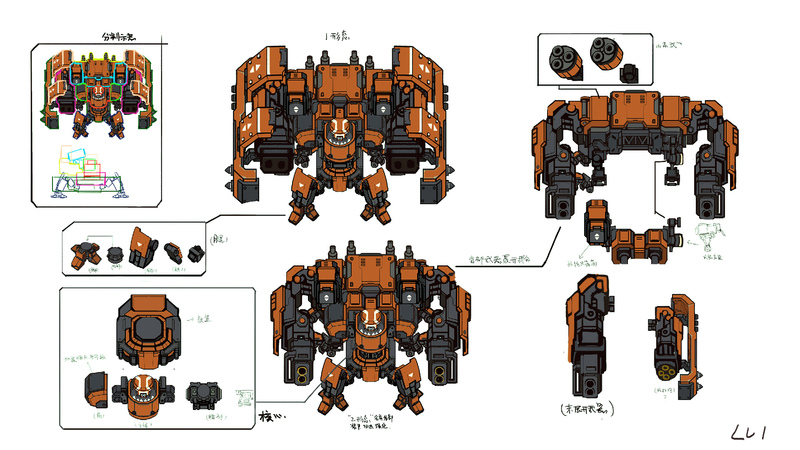 Mechs need to have structural support to ensure believable movements and deformations. If the initial design is sound, animation implementation is just a matter of course. The next step is to determine the details of the animation: how the unit behaves, how it is attacked, how to deploy weapons, and so on. If we determine that the design is feasible, we create a model for this unit and place the final look of the boss in the game environment to determine its effect in the scene. Next, we start to create the animations themselves. We disassemble all the joints used, render the perspectives required for some joints separately, and then import these joints into the animation tool. Certain elements or joints, if they are symmetrical, can also be mirrored to reduce any unnecessary workloads. 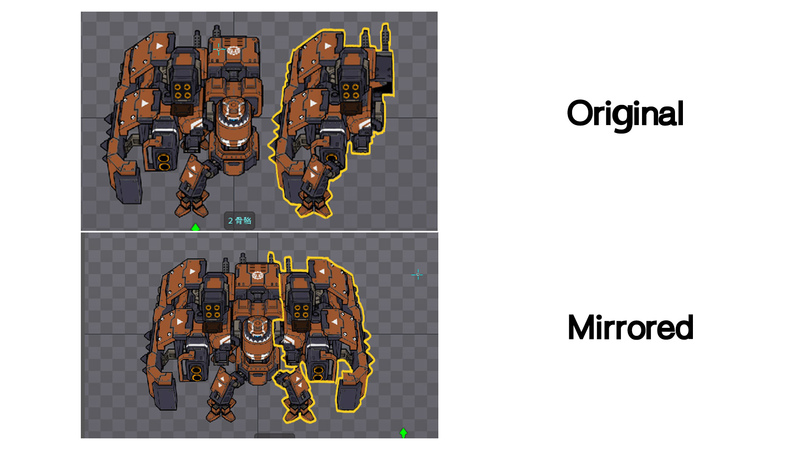 For example, if a mech’s right side weapons platform is identical to that on the left side, then mirroring the asset makes sense. During this process, it’s possible to achieve an even higher degree of visual accuracy by implementing an animation technique known as Free Form Deformation. FFD involves defining a mesh on a normal 2D texture, which allows the texture to be transformed by manipulating the mesh. From here it’s possible to obtain various perspectives of the original texture, resulting in smooth transitions and achieving an almost 3D look. 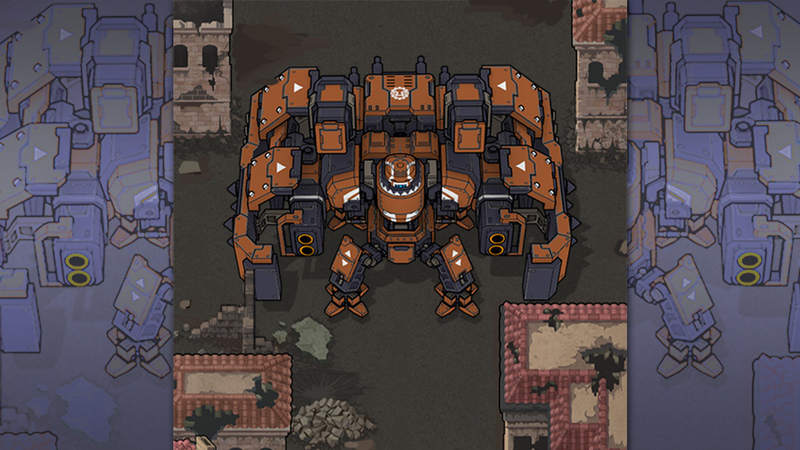 Once the animations are complete and rendered within the game world, the boss mech comes to life. The original idea conceived back during the design stage is now an entity that players will soon be able to interact with. This process is repeated for every enemy you’ll face in AngerForce: Reloaded, and also for each of the four playable characters. Check out the game when it launches on 2nd April!